See all O`ahu has to offer and enjoy a ride around the Ko`olau Mountain Range. Visit the South or North Shore on a Mini Circle Island Tour, or see them both in one. Guests can enjoy the water, beautiful hidden beaches, great shopping, phenomenal restaurants, and much more. This island offers so much variety and beautiful scenery, you have to see it all! See the beauty of the Ko`olau Mountain Range on all sides! There is such a huge variety of breathtaking views and activities. Guests are picked up at virtually any hotel, airport, or location and given a personalized private tour of O`ahu. Choose the perfect sights and activities for you and your family. Enjoy a tour featuring as much swimming, hiking, shopping, great food, photography as you want. Choose between Your Half Day (6-Hour) Tours, Your Full Day (9-Hour) Tours, and Your Long Day (12-Hour) Tours. Your Circle Island Tour will give you great options, from World Famous places to hidden gems, just off the main roads. Your route and itinerary around the island is completely designed around your groups tastes. 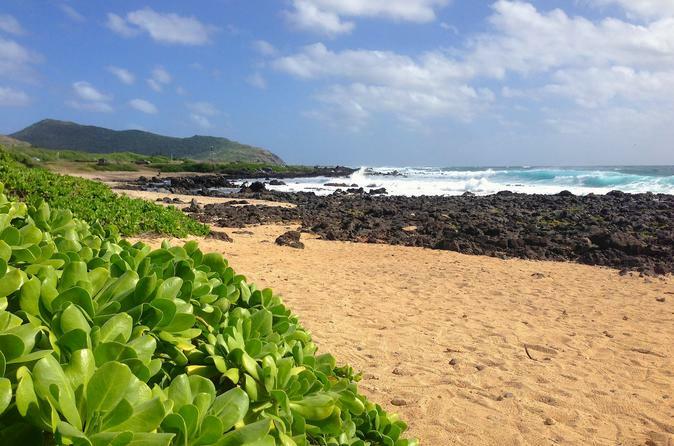 Visit beautiful beaches, Kualoa to see where Jurassic Park was filmed, try a shrimp truck, then head to the North Shore where you can watch world class surfing in the winter time or snorkel in the summer. You will love your day around the island! Choose or combine almost any activity with Your Circle Island Tour. Combine the Circle Island with Waikele Outlets, Aloha Stadium, Hanauma Bay, Diamond Head, Dole Plantation, Nu`uanu Pali Lookout and so much more! Essentially any activity, or stop, can be included in Your Customized Private Tour! Your options are virtually limitless and every experience is tailored to your groups wishes and desires.